Fully sculpted in Quality Polymer Clay and entirely hand painted with fine acrylic washes our Japanese Nun stands approx. 15" tall. 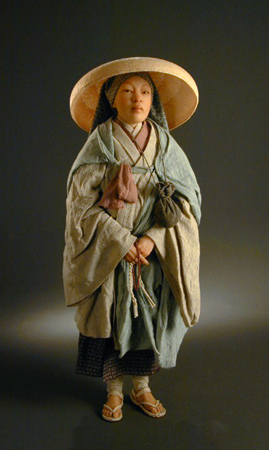 Her robes are hand dyed , her zori sandles hand woven... and her large bamboo hat was made using the traditional method of hat making.